Richard Mackie, author of the book Mountain Timber now has a webpage, which you can find right here, so do take a look. The book has experienced great success, having been on the BC best seller list for 14 weeks, ranging from no 4 to no 8. 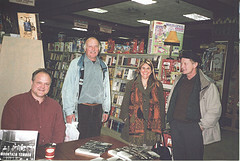 Pictured at Bolen Books, Victoria, are L-R: Richard Mackie, Len Todd, Cathy Richardson and Julian Wake.